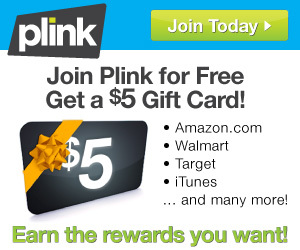 If you haven’t yet taken advantage of any of the great offers from Plink, this deal will give you a FREE $5 Gift Card to Target or Amazon without any purchase requirement. Their easiest deal yet! Use Plink when you shop or eat out or even when you go to the movies. Add “offers” to your account and get points for purchases made with the card you used to register with Plink. If you are a Dollar General shopper, you’ll be glad to know they were just added to the long list of places you can earn rewards from with Plink. It’s very easy to get signed up, and once you register at least one debit or credit card, you should see the 500 points show up in your account. It may take about 5 minutes. Then you can cash it out for a FREE $5 Gift Card to Target or Amazon or many other places. I agree with the others. No way an I going to link my bank info. You mention this “free” Amazon giftcard from Plink several times in your website, BUT….you do not clearly mention that to join Plink, it requires you to give Plink your credit card info, AS WELL AS, you PASSWORD !!!!! FOR YOUR BANK card. When I first read here about the FREE amazon card, I was so excited, but as soon as PLINK required my existing passwwrd for my bank card, I walked away. I can not believe Plink thinks the regular customer is going to give over that sensitive info to them. It is so not trustworthy to do this. HURRY! FREE Algenist Firming Cream Sample!